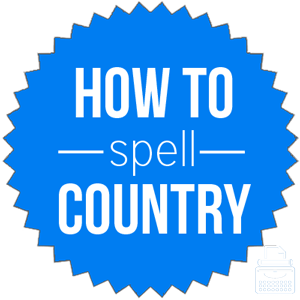 Spelling of Country: Country is spelled c-o-u-n-t-r-y. Definition of Country: Country has a few different senences. First, country refers to the land of a person’s birth, citizenship, or residence, as well as a political nation or state, or its territory. It also means a rural area or expanse of land. Finally, it can also mean the people or residents of a state or territory. It may also be used as an adjective describing something related to or typical of the country, as in a rural, non-urbanized area. Pronunciation of Country: Country is pronounced kun-tree. What does country mean? Country is a noun. It usually describes the land or territory in which one was born, resides, or has citizenship. It also refers to the territory of a given political state or nation. I am from Canada. Which country are you from? He took a plane from his home country, China, to the United States of America and started a new life. Country is also used to describe land or regions that are rural, as opposed to urbanized and developed, like a city. When asked about her hometown, she always told people the nearest city because she was from a small, rural town in the middle of nowhere out in the country. She could not fall asleep in her new apartment in the big city because she was used to the sound of the crickets and frogs in the country. As an adjective, country describes nouns as being typical of or related to the country. Additionally, it describes a specific genre of music: country music. We spent the day driving down country roads with the windows down and the music blaring. Country of origin: the country from which someone or something originally comes. The old country: the country in which a person lived or was born before moving to a new country. Across country: (to go) from one side of the country to the other, or, a route taken through the countryside rather than by main roads and highways. The country: the populace of a given country; the people who live in a certain country, or, a rural region that is away from the city. Friends, Romans, Countrymen, Lend Me Your Ears: famous quotation from Shakespeare’s play Julius Caesar. The word country was first used in the 13th century, according to Merriam-Webster’s. Country comes from Middle English, contree, from the Anglo-French word cuntree, contre. The latter is derived from the Latin word, contra, meaning against or on the opposite side. When talking about one’s home country or country of residence, the following synonyms can be used. When referring to the definition of country as a political state or nation or its territory, the following synonyms may be used. As for country as a noun referring to a region where it is rural and non-urban, the following synonyms can be substituted. Synonyms for country as an adjective include. Country can function as both a noun and an adjective. As a noun, country may refer to one’s native land or current residence, a political territory, or a rural area. As an adjective, country describes things typical of the countryside. It is also used to denote a specific genre of music: Country music.